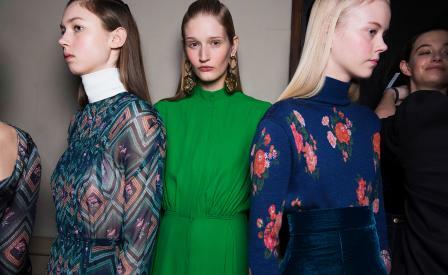 Mood board: Change was in the air at Emilia Wickstead this season. The New Zealand-born, London-based designer seemed to loosen the reigns on the fitted evening dresses that made her name, displaying a fluid and mellower offering. Silhouettes harked to the 1970s, offering a romantic, post-Victoriana feel. Dresses were spun from diaphanous printed silk, while rouched romper suits boasted tactile polka-dot embroidery. Untied velvet ribbons hung loose from the models’ hair in a quixotic fashion. ‘She colours you beautiful and makes a life out of loving you,’ proclaimed the show notes. Scene setting: Wickstead situated her A/W 2017 show at The College on Bloomsbury’s Southampton Row – the former Central Saint Martins site, where she was once a student. Perhaps this would explain the nostalgic, yellow-tinged mood lighting that filled the intimate space. Best in show: In addition to the rich assortment of easy, elegant dresses on show, the designer also debuted a pair of jeans. Crafted from indigo-blue denim, the slim-leg style sat high on the waist, creating a flattering counterpoint to delicate crop tops and silk blouses with balloon sleeves. The luxurious, cashmere-blend overcoat with two-tone blue panels was another high note.